Is your chimney blocked? We can help. Call us on 067 103 0999 or send us an email at sales@chimney-sweep.co.za. We service all major fireplaces and braai places. If you suspect your chimney is blocked it will become very apparent as soon as you start a fire inside of your home. Many of our clients have called us complaining that when they light a fire in their home, almost immediately the air filled with smoke. They needed to open the windows and doors and air the house out for a few hours. This smoke that enters the home because of a blocked chimney contains carbon monoxide and it is indeed very dangerous to the health of you and your family. Carbon monoxide is the reason you need to have your chimney swept at least once a year. Prolonged exposure to carbon monoxide can wreak havoc on your health, causing you to have chest pains and feel generally flush. When you use your fireplace for a couple of months over winter, the creosote builds up daily and the end result will be a chimney that cannot function at one hundred percent efficiency. The build-up narrows greatly the path through which the smoke can exit and this leads to a leak of carbon monoxide into the home. The chimney will eventually become full blocked and cause a tremedous complication when a fire is started in the home. A chimney sweep with remove this blockage, allowing the chimney to work at its optimum. 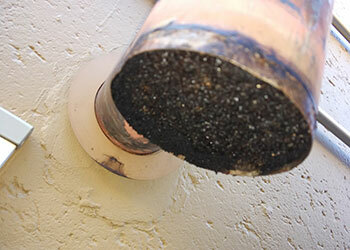 Creosote is indeed ignitable and becomes a fire hazard when the build-up is great within the chimney vent. This is a cause for concern where there are small children or pets who are vunerable in the home. A chimney ventalation inspection should be done to confirm that it is safe to start a fire when the fire will be unattended by an adult during the fire's full course. The creosote could become brittle and plunge from the chimney flue onto the already lit fire. The best way to be rid of this issue is to have the chimney cleaned before it will be used regularly over a few weeks or months. When a chimney is blocked or is very close to being blocked and the smoke is obstructed from exiting the vent it is very difficult to get a fire going beneath. This is because fire needs oxygen to burn, when the chimney flue is blocked this becomes impossible. Starting a fire with a blocked chimney flue is not recommended for many reasons, the fire will inevitably become chocked. The risks are too many and it is most probable that the experience will not be what it should be if your chimney was clean. 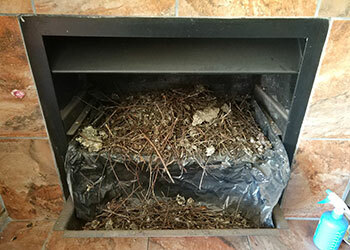 A chimney cleaning from us will solve all these problems and eradicate the uncertainties involved with starting a fire in a fireplace where the chimney flue is clogged. 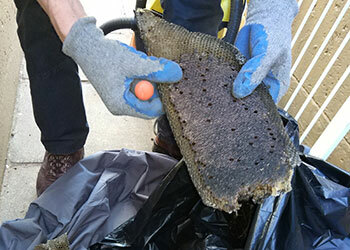 A blocked chimney is thoroughly preventable with a once a year chimney cleaning. A chimney cleaning will only take about an hour to perform and then you will be set for the next twelve months to enjoy the peace of mind that your home is free from poisonous gas and the fire hazard associated with a blocked chimney. Along with that, creating a fire in your fire place will be much more easeful because the fireplace is properly ventilated and ready for day-by-day use.